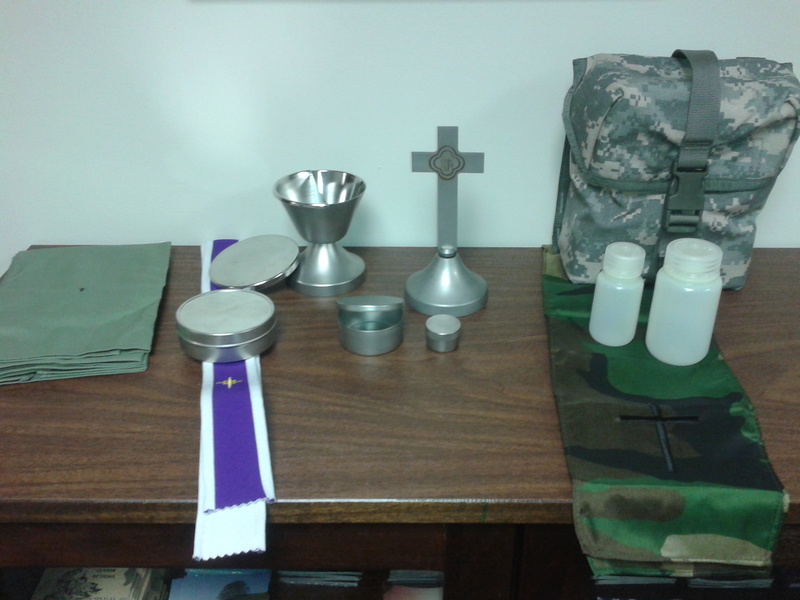 Each chaplain is issued a chaplain kit when they complete their initial military training. Over the years they have been called by various names to include chaplain kits, field kits, field altars, etc., and have ranged from the very bulky and heavy to very portable. 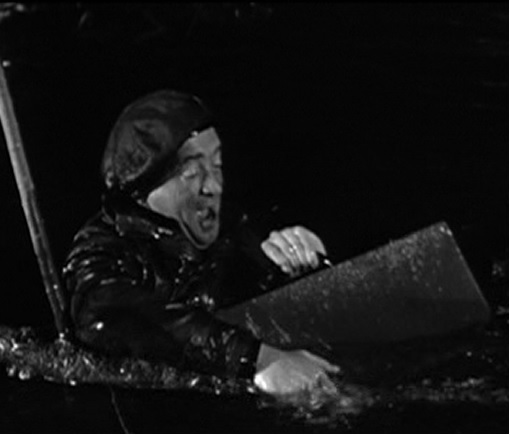 Perhaps the most well-known portrayal of a chaplain and his kit can be seen in the movie, “The Longest Day” when on D-day a chaplain is seen searching in the water for his heavy, non-floating, field kit. 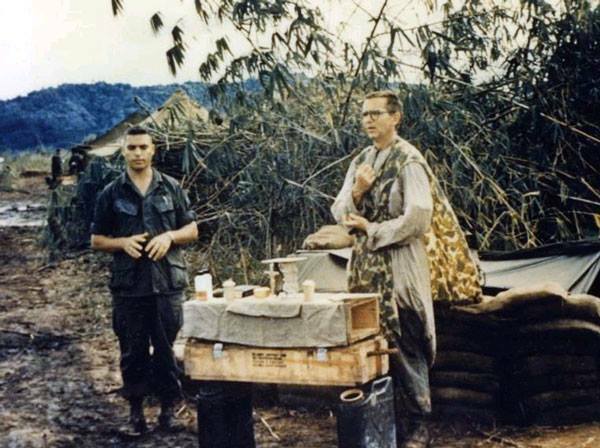 The chaplain portrayed in this scene, or from whose story it is inspired (Chaplain Sampson), went on to become the Army Deputy Chief of Chaplains and directed that a more lightweight and portable chaplain kit be developed. The current kit is the lightest and most portable to date. It comes in two nylon cases, though I combined mine into one case for ease of transport (a 200-round SAW pouch, for those interested). It comes with everything necessary to perform a worship service with the celebration of Communion. This next kit was used during the Vietnam era. It is designed as a light-weight kit that has everything needed to perform a worship service with the celebration of communion, including having candles! I’ve been told that it also floats, to avoid loosing it in situations where you may find yourself in water! 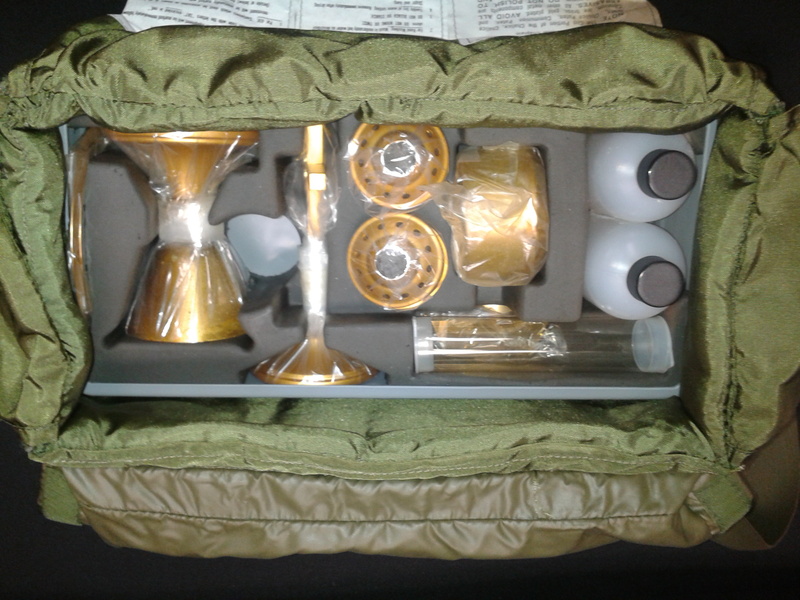 A look inside of the new kit I just received from a chaplain friend. This is a new (in box) kit of this era which came with everything they were originally issued with so is complete and “like new”! The new kit I received all packed up and ready to go. Still too large for an Airborne jump though! As we move back in time, we see the kits get more bulky and heavy. 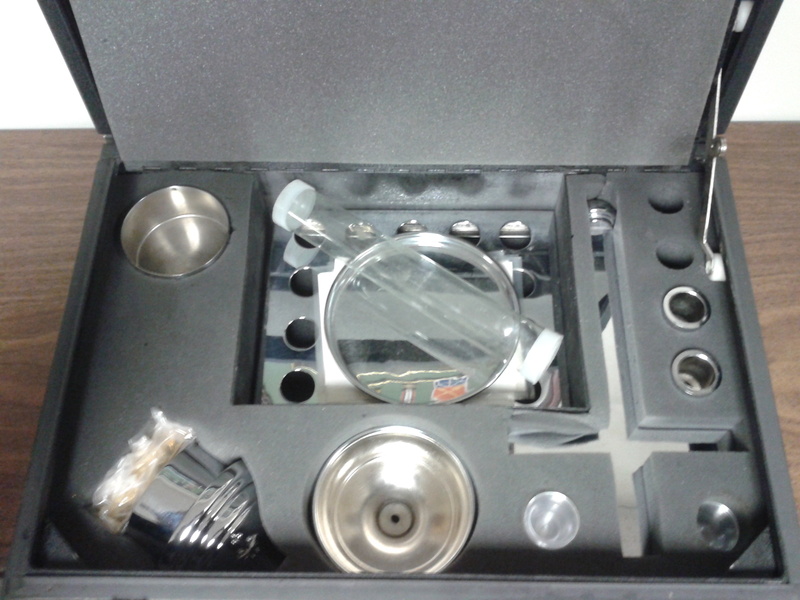 This kit comes in a metal box and has altarware that is larger and heavier, though it provides a more satisfying set-up. This kit began being issued following the Korean War. This particular one is dated 1962. Kits. It turns out that her father, who is a retired UMC minister, was given this kit from a friend who found it in the attic of a house that they bought. 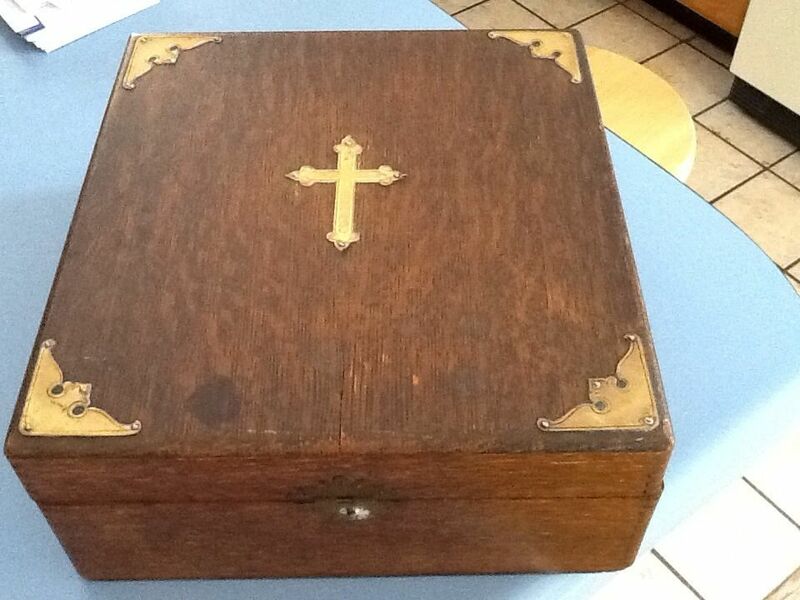 It looks like a retired chaplain stored it away, to be found half a century later . . . so that I could get it and preserve it for future generations to enjoy! This next kit was used primarily by Navy chaplains on transport ships. I’m still trying to find out if they may have been used by some Army chaplains. They began making this particular kit for World War Two but they continued to be used through the Korean War and into the Vietnam War. 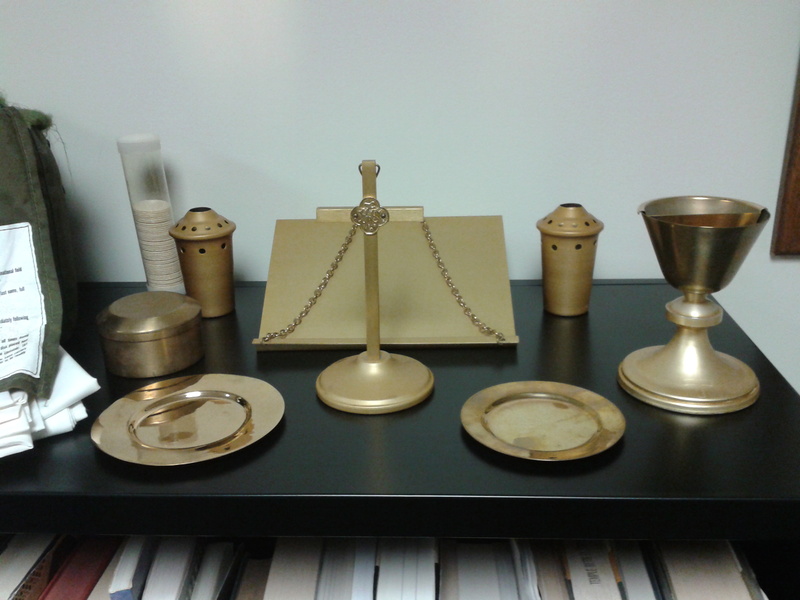 It consists of individual cup communion trays, two bread trays and a nice chalice. This particular kit, while it shows signs of being used, is in very good condition. I came across it on an online auction site as a “Buy-it Now” item but I made a lower offer and it was accepted! Always nice to get a new kit for a good price! 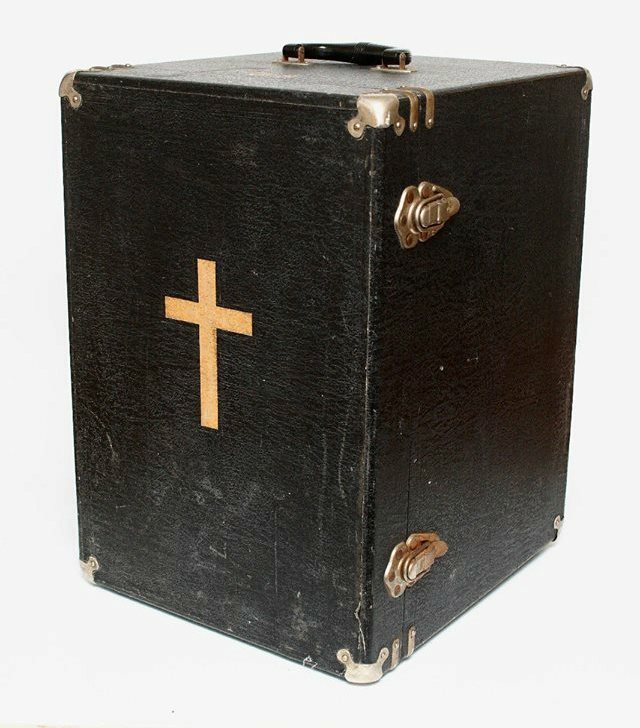 I just aquired an interesting find from World War I. I found this box which originally was part of the Homan’s Sick Call Outfit patented in 1897. By itself it wouldn’t attract my attention as a chaplain item, but what caught my eye was that on the back is written, “23rd Infantry 3 February 1918 France”! This sure makes it sound like a chaplain had used it. Whether he used it for last-rites as it was designed or as a portable field altar I am not sure. In World War I, Roman Catholic chaplains were issued a chaplain kit from the RC Church which continued relatively unchanged through World War II, though as it was larger, heavier and more bulky I could see why a chaplain may have carried this smaller set-up into the field. 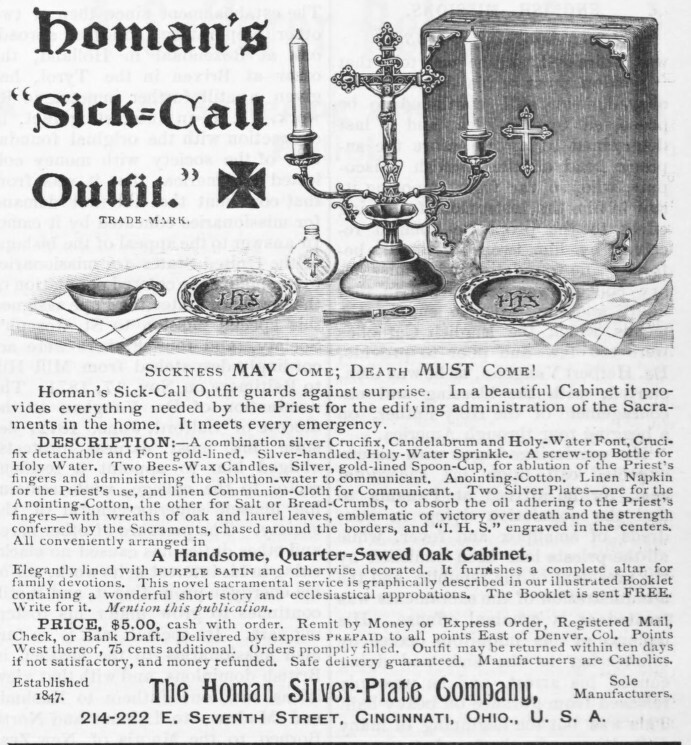 Advertisment for the Homan’s Sick Call Outfit from 1897 or 1898. An advertisement for this kit in a periodical from 1897 states that it “furnishes a complete altar for family devotions” so a chaplain could have used it to provide worship or celebrate mass for the troops. Hopefully I’ll be able to find out more information on chaplain kits used in World War I and maybe even identify the chaplain who took this one with him on deployment to France. In the mean time, since the box came empty I’m working on replacing the articles that would have come with it which include a combination crucifix/candelabrum/ holy water font, two trays with “IHS” on them-one for salt and one for cotton, a bottle for holy water, a spoon-cup and a brush (I don’t anticipate finding the original cloths for it, though! All of the previous kits have been for Christian or Catholic chaplains. This next kit is from about the era between Vietnam and the modern era, but is designed for a Jewish chaplain. Missing from this kit are the Torah scrolls and the yad. Here is another Jewish kit but is a current issue. 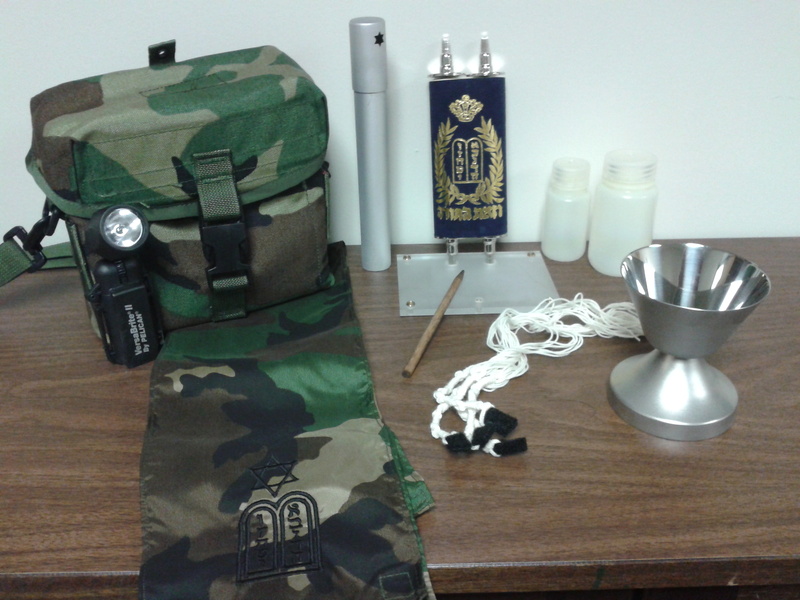 This one is very much lighter and more compact but has everything essential for a Jewish service. 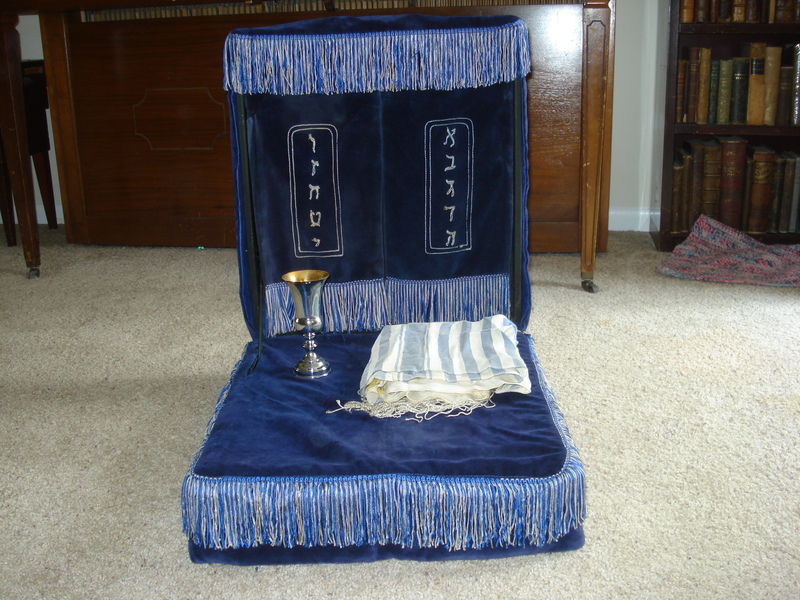 Unfortunately, it’s missing the legs to the Torah stand, but I’m working on getting these replaced. There were other smaller kits issued for more specific uses or distinctive faith groups. 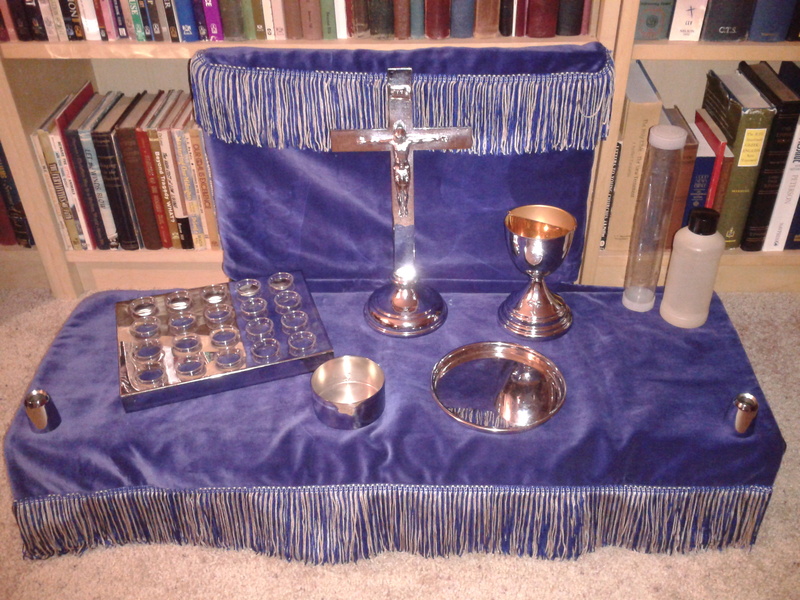 This kit was essentially for a more “liturgical” celebration of the Eucharist. It includes a chalice, cruet plate and two cruets. 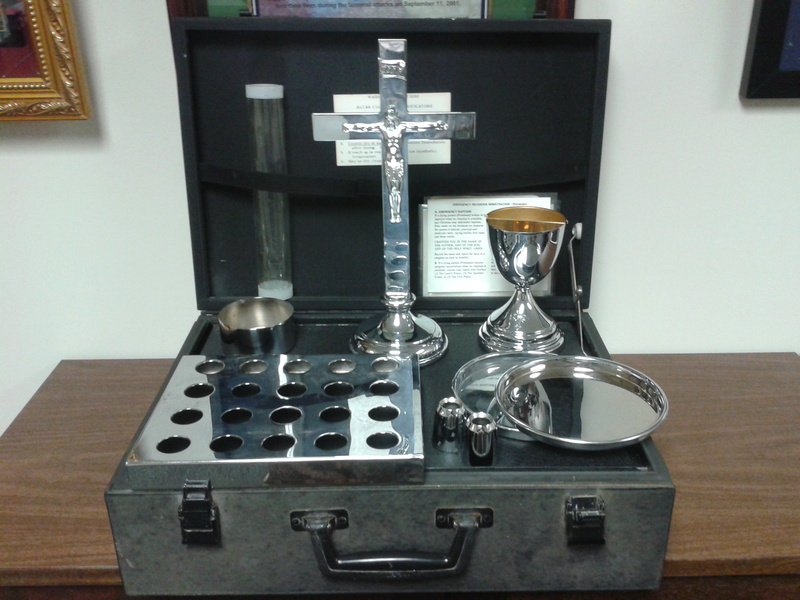 I believe that there is at least one or two pieces that my kit is lacking (the ciborium and communion paten). Another small, specific kit that I have seems to be for small-group communion, perhaps for hospital visitation or squad-size worship. It comes with an individual cup communion tray. 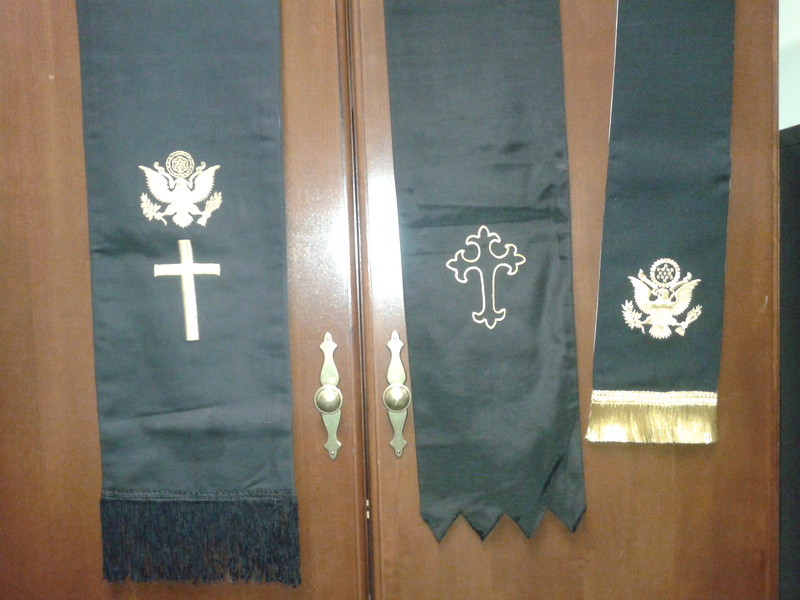 Related to the chaplain kits, but issued separately these days, are the chaplain stoles that are worn by chaplains in worship or during certain funerals or Memorial Ceremonies or Services. The three that I have include the one issued to me (far right), one issued during World War Two (far left) and one used during the Vietnam era (center). All of the kits, equipment and supplies are issued or provided to chaplains, not to endorse or establish any particular religion, but to enable chaplains to provide for the free exercise of religion for the Soldiers in their unit. Chaplains either perform worship services according to their religious tradition (in the field, often using the chaplain kits seen in this post), or provide chaplains and/or worship opportunities in other faith traditions to allow as many Soldiers in the unit as possible to worship as they desire. However, it is also the chaplain’s duty to ensure that Soldiers who do not desire to worship or practice any particular religious rite are not required or unduly persuaded to do so. It is the chaplain who the commander relies on to ensure the Constitutional right of every Soldier to worship according to the dictates of their own conscience. 1 Brinsfield, John W., Jr. “Encouraging Faith, Supporting Soldiers: The United States Army Chaplaincy, 1875-1995. Part Two.” Washington, D.C.: Office of the Chief of Chaplains, Department of the Army, 1997. 3.
wow! did you Daryl have to carry and ship all this stuff over to the middle east with you?………again……just wow! what were the small glass cruets for? No, I would generally just carry the last one-the smallest one! 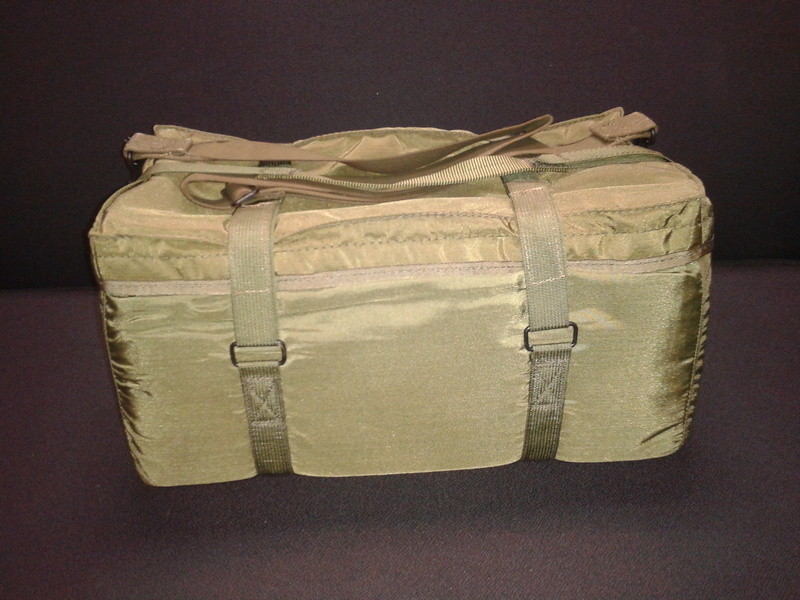 Though the one with the green nylon case I would often use for field services when not deployed. The others are more for me to help preserve chaplain history . . . 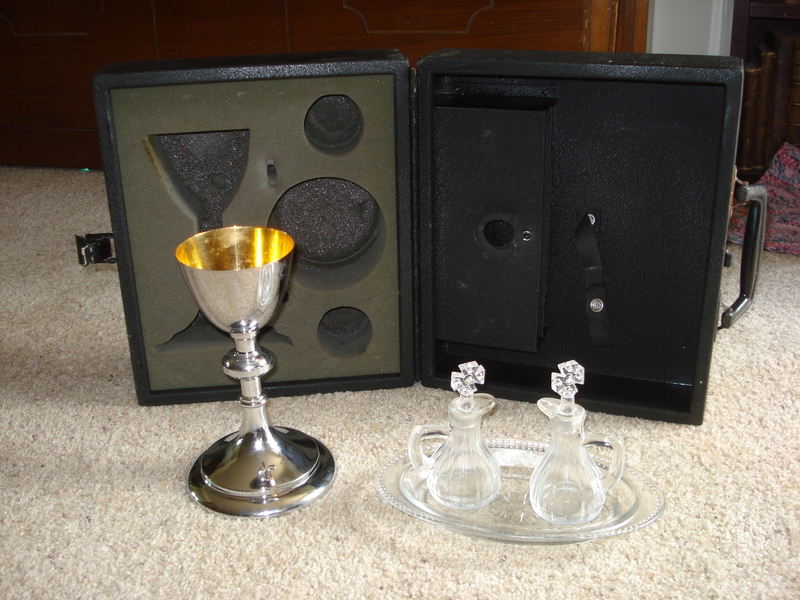 The cruets are more for “liturgical” or “sacramental” chaplains who would have water & wine in them for the celebration of the Eucharist. 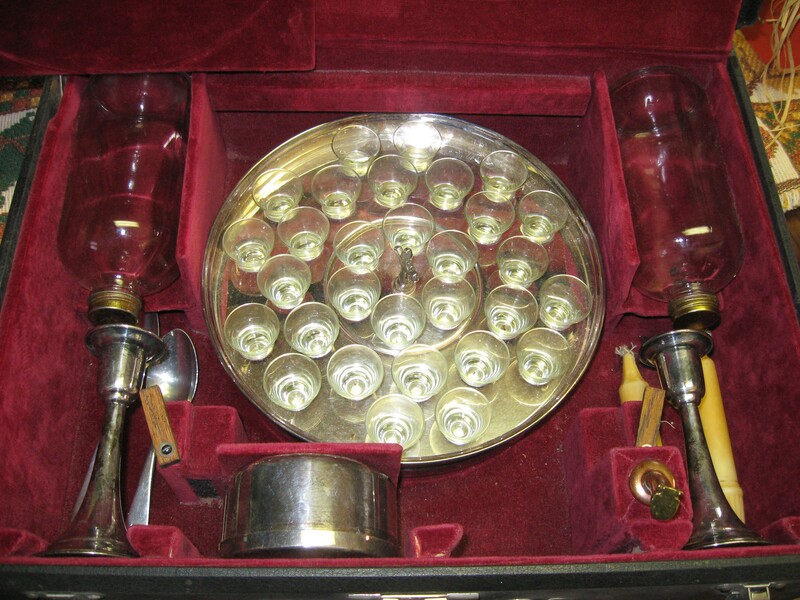 The cruets are for wine and water which are mixed together during the celebration of the Eucharist (Communion, the Lord’s Supper), primarily by more liturgical chaplains. What a find! I would love to stumble across one of those. These days, and back as long as I have knowledge of it, the chaplain kits were issued to specific chaplains to use after completion of the Chaplain Officer Basic Course upon entry into the Army. I’m pretty sure it was the same in WWII as I have seen kits from this era with individual chaplain’s names on them. The presence of the stole in a chaplain kit doesn’t alway indicate the date of the kit. Often times favorite pieces from other kits are combined to form the “ideal” kit for that chaplain. I often use an older kit to this day. If the case is metal or plastic it’s probably not WWII era. If it’s wood or a wood-like material with metal protectors on the corners, it’s likely WWII. Since the kits didn’t have serial numbers on them, unless you find a chaplain’s name, unit, location, etc., there is really no way to identify the owner. Perhaps you could get information from the owner or previous owner of the house you found it in. By the way, are you interested in selling it? Hi Daryl, I’ve been looking off and on for a year or so now for info on a kit much like that smaller hospital or field squad kit you have. I found it in a box that was donated to a thrift store. I’ve come to think it’s not as old as the WW2 things you’ve talked about but maybe? 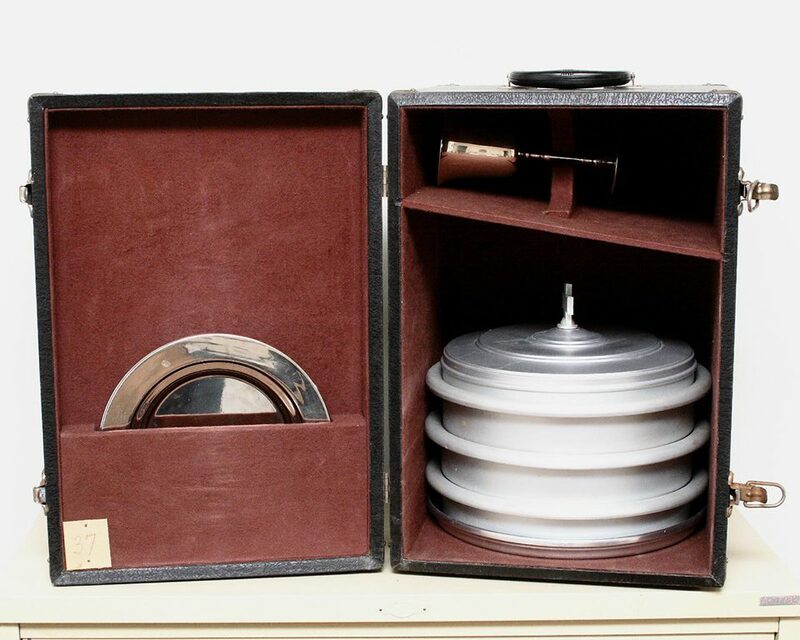 All the pieces, the wafer tin, the tray and the communion tray are silver on copper. It’s missing all its cups (those little glass things) save one. I’d like your expert opinion if you care to share on it’s potential value. The value of anything is based on what someone is willing to pay. I haven’t seen a set like this come up for sale so it is hard to determine. It isn’t that old (10-20 years), definately not WW2 so the value isn’t gained so much by it’s age. It’s uniqueness does give it some value, though since it wasn’t a widely used set there may not be as much interest as in the larger sets which include the cross, chalice, etc. I’m not sure how much of an “expert” I am, but I would estimate it to be worth between $50 and $100, though with it missing most of the cups, probably closer to $50. Is it all in good condition? does it have the storage box, protective cloth bags and plastic bottles? These would also impact value. I hope this helps. Feel free to ask any other questions you may have. I would also enjoy seeing a picture of what you have. Again, though, anything is only worth what someone is willing to pay for it. I’ve seen things go for very little that I thought were worth more while other things went for 2 or 3 times what I thought they were worth. So you never know. Someone who is more of an “expert” on this stuff than me is found on the US Militaria Forum as “Chap 15.” HIs collection (and the possibility of contacting him) can be found here: http://www.usmilitariaforum.com/forums/index.php?/topic/8174-chaplain-collection/ This forum also has a “What’s It Worth” page to list items you have, though you have to be a member of the forum to post there. Excellent page and a great find. 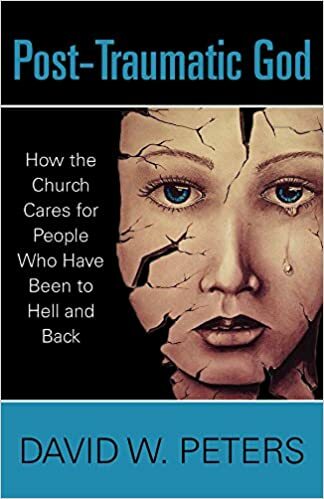 I hope you don’t mind but I have put a link on my web site ‘Chaplains at War (UK)’ https://sites.google.com/site/chaplainsatwar/home on the ‘links and resources’ page. Every blessing in your ministry. Thanks for stopping by. I’m glad you enjoyed the page. Linking to it is fine, thanks! Greetings from a British Army (Reserve) Chaplain. Been Padre with a Rifle Btn for 9 months now and got a few pieces of communion set given by previous Padre, most of which is too big for any real use. I’m abroad with Bn soon and so am trying to combine things in a medic trauma pouch so it’s easy to transport. 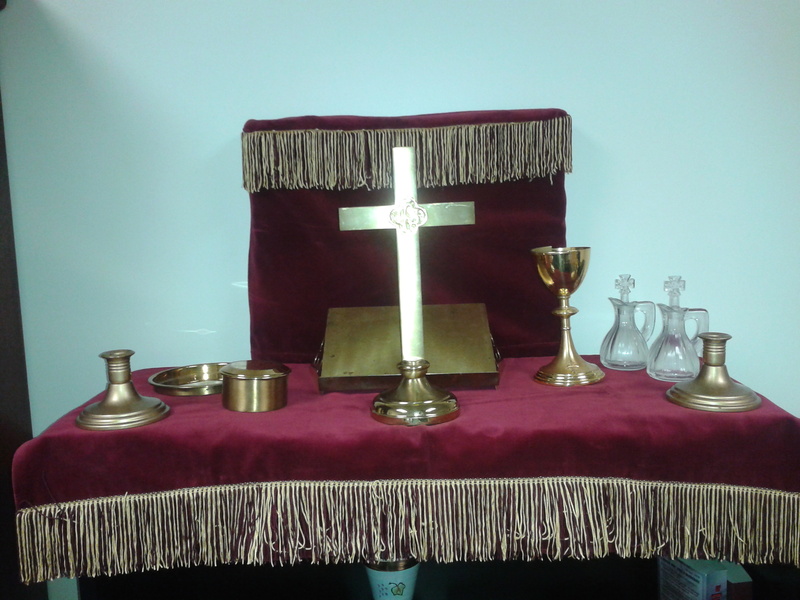 Got the Chalice, Plate, small wooden Cross and two stainless steel bottles for liquids. Only things I don’t really have are some kind of wafer/bread container, and linens. Any ideas for suitable items or alternatives? I believe the current US issue kit is available to British Army too, so I’ll look into that! I’m sorry for the delay in responding! Thanks for visiting my site! I would say the ciborium and linens that come in the current U.S. kit would work well for you. I recently had a Canadian chaplain contact me about the current issue U.S. kit. I’m not sure if he ever got one or not… let me know if you need help getting to one (if that’s your desire). Apparently the battalion have a kit somewhere, so gotta try and find it! Off to Cyprus this week with them so have made my own little kit. I don’t see a picture of my Dad’s communion case. He was a Chaplain in the Army and was stationed in England during the war (World War II). I have his case. It is like a small black suit case with red velvet interior. 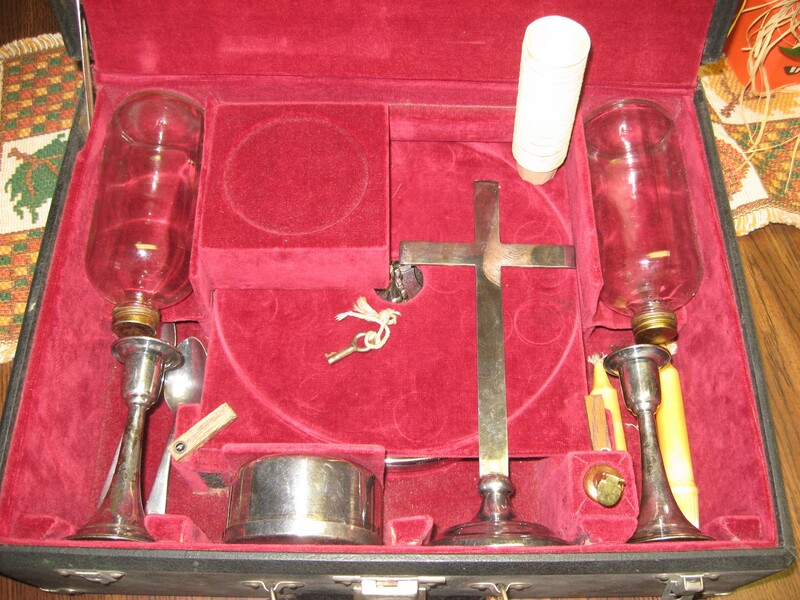 With a silver cross, plate, two candle sticks and a goblet. There is a table cover with a small red cross. His name and serial number is printed on the outside. Is it similar to the one pictured at this link, the 3rd and 4th picture? 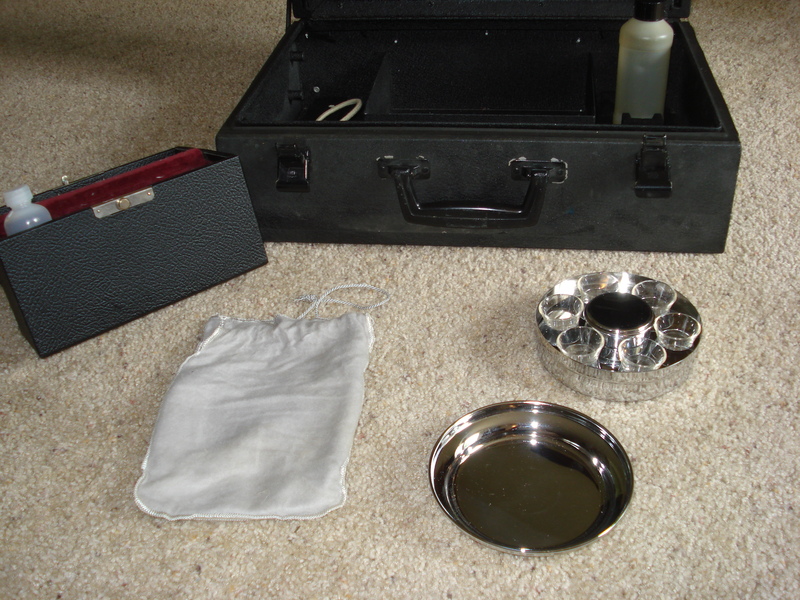 (http://chaplainkit.wordpress.com/chaplain-kits/ww2-era/) This is a WW2 kit, but with the individual cup communion tray instead of the chalice. I would love to see pictures of your dad’s kit! I will try to get you one. It may take time. I will need help on how to do this. We have acquired a WW II Chaplains Mass Kit (US). This kit is almost identical to the one in pictures 9 and 10. On the outside of the case there is Chaplains name, number and state. I would like to send you pictures for you to view and guide us in obtaining a value. I’m glad you stumbled across my site! I’d love to see pictures of the kit you acquired and will offer a value from my experience. I’ve PM’d you my e-mail address. I recently came into the possession of a large, World War 2 era Chaplain’s Kit. The kit is made up of 2 large, labeled, official Chaplain’s cases full of gear. Would you be interested in viewing this collection? Yes, I would love to see it! I sent you an email. is there any way to buy the current us chaplain kit or is it only ‘issued’ when you’re a chaplain? i was looking all over for it, but it seems there’s now way to get it. if you could help me somehow in acquiring it, i would be greatly indebted to you. They are issued when a chaplain completes their basic chaplain course. They can also be purchased through the military supply system by a military unit. At one point I was informed you could, and had contact information to be able to purchase one direct but I have since heard that that is no longer possible. You occasionally see them come up for sale on eBay. That may be your best bet, though it could take a while!